This is one of the best pieces of advice I’ve collected about writing. Put each sentence on a separate line when you write. When we read, we hear a rhythm. There is a rhythm to the words. And when we read, we look to find that rhythm, which pushes us through the end of a sentence, so if I write a really long sentence, and the reader isn’t expecting it – like this one – the reader will find it really hard to follow and understand where I am going. And if I keep writing really long sentences, I’m going to exhaust the reader, because there’s no place to stop and take a breath and think about what it is that I have written. If I write a short sentence, you can breathe. Separate lines help you see your reader’s journey. 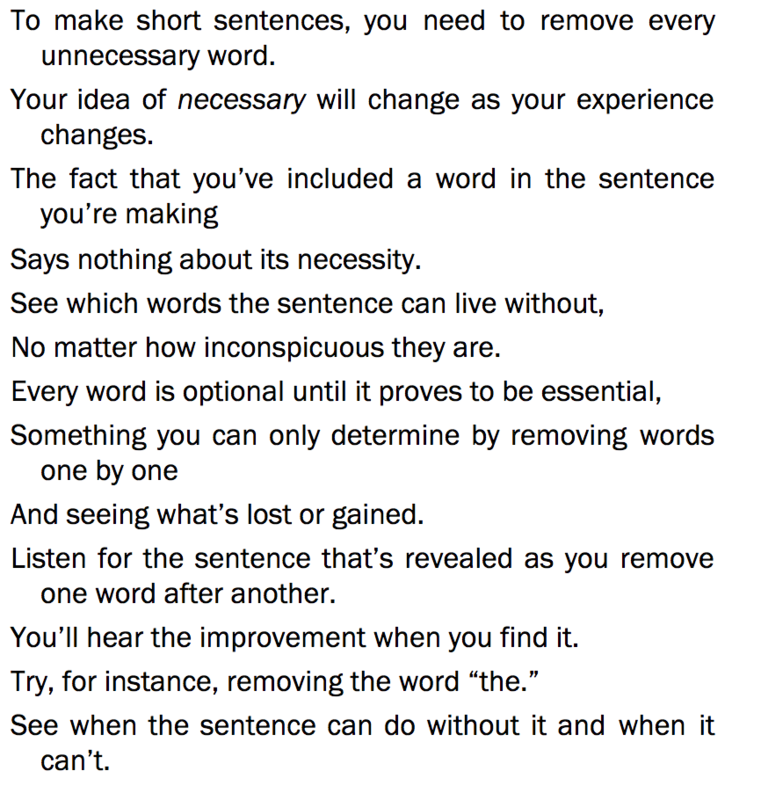 By putting each sentence on a line, repetition in structure or words will jump out at you. Verlyn Klinkenborg is a former member of the editorial board of the New York Times. He wrote a book called Several Short Sentences about Writing. The entire book is written with one sentence per line. And the effect is remarkable. You can hear his voice and see the effect of clear writing. Give it a try the next time you write. Being a writer is an active perpetual self authorization.